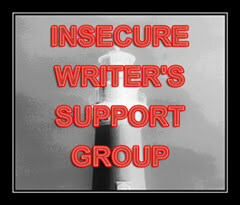 As a member of the Insecure Writers Support Group, I am grateful for the opportunity to share my insecurities and worries with like-minded people. It has been so refreshing to discover that other writers are feeling some of the same things, fighting some of the same inner battles. Two things I keep hearing over and over: we’re all in this together, and we are not alone. So what’s my freak-out for this month’s IWSG post? I worry that I take more than I give. After all, what have I got to offer other writers? Who am I to give advice? Let’s face it; I’m a self-published romance writer who doesn’t earn enough to support myself with my writing. I’m part of a crowd, lost in a sea of self-published authors in a huge genre. I’m not exactly a glowing success with heaps of wisdom to bestow on others. Some folks might even call me a failure as a writer. I work three part-time jobs on top of writing and still can’t make my rent, but I’m optimistic enough to keep writing anyway. Or stupid enough. I’m not sure which. Depends on how much coffee I’ve had on any given day, I guess. A few years ago, I was lucky enough to meet one of my writing heroes. She treated me with respect as a fellow writer; she gave me useful advice and some great writing tips, but she did so much more than that. She believed in me. She didn’t mock me or condescend to me, or treat me like someone chasing a stupid dream. I don’t think I would have finished my first book without her encouragement. Since then, I’ve encountered so many others who have given me that same gift. The kindness of my fellow writers has been nearly overwhelming. These guys give, give, give. Sometimes they give great advice, and sometimes they merely dispense a heartfelt “attagirl” at just the right moment. There are days when my fellow writers tell me something I really need to hear at a time when I really don’t want to hear it, and they care enough to tell me anyway. How many times can I say thank you before the words begin to lose their meaning? How do I give back? In the grand scheme of things in the writing world, I’m pretty much a nobody at this point. I worry that I’m wearing out my welcome among writing groups by always taking, taking, taking the good stuff and having so little to offer in return. If the time ever comes that I can truly call myself a success, I’ll do everything I can to reach out for those who are struggling in all the ways I’m struggling right now. But until that day, how do I pull my own weight among my peers? I’m interested in hearing what some of you do to support each other, no matter what your level of success. I’d welcome any tips or suggestions on what I can do to give little something back to the writing community. Probably my favourite book, which isn’t just about writing is “The Outliers” by Malcolm Gladwell, which talks about needing to put in 10,000 hours of practice to be successful in a given field. It’s not based on talent alone. Just a couple of titles to think about, which you and then others would find helpful. Good luck and I admire you for getting your novel finished and published. Good on you! Thank you for the kind words, and for the links. I’m going to go check them out right now! “How many times can I say thank you before the words begin to lose their meaning?” I don’t think that’s possible. Seriously. I totally get the taking, taking thing, but I find there are seasons in writing. We go through stages when we give more than we receive. We got through stages where we receive more than we give. It all balances out in the end, and what we’re left with are relationships–the greatest blessing than can come from a writing career. You’re are giving back just by writing this post! It’s huge that you’ve accomplished finishing a book and publishing. It’s all timing too, there will be plenty of times that at the right moment, you’ll give someone that “attagirl”. 🙂 Have a great day! Thank you. You have a great day, too! Normally I never tell a writer “never” but I am today. Never diminish your talents. You finished a book. You published it. Yay! You give back when you boost others. That “atta, girl/guy” means so much. Hang in there. That’s a pretty awesome “never”! Thank you for that! Not at all, but you might want to treat yourself as you treat others. A little belief can go a long way. Use the same words you’d offer to another in a moment of doubt. You deserve them too. Thanks for the reminder. Sometimes it’s easier to be nicer to others than we are to ourselves. The thing I love about being a writer is the sense of community. Even if you’re low on the ladder (as I am too) there’s always someone there to talk to you, support you, and give you advice. The internet has been a blessing for writers too, bringing us together in ways we never could have done before! Absolutely! When I first started self-publishing, I got mixed up with a few of the Negative Nellies who like to snark and pick, and I was really worried that ALL writers were like that. Now, I’ve been lucky enough to find a much better crowd. Really, we all do so much better when we support each other and show a little kindness. A.J. showing support is showing up, being there for someone. You don’t have to be the expert. You are there for all the people in your group. Thanks for being part of this one! You have one book published. You’re already much farther down the path than many wanna-bes. I’ve also found writers to be incredibly generous with their time and advice. That’s why when I encounter a writer who is not, it’s really surprising and hurtful. This community is small enough that people do talk. Kindness matters! You are SO right. I’ve met a few of the unkind ones and gotten on the wrong side of one of them when I should have just taken the high road. It was hurtful and discouraging and I came pretty close to giving up a few months ago. It got so bad that I considered un-publishing my books from Amazon and starting all over again with a new pen name. But then I found this group and discovered that the majority of my fellow writers are actually very supportive people. So . . . kindness matters. It really makes a difference. You don’t need to have wisdom to share to help uplift other writers. We’re here for each other and sometimes a simple cheering can be the key to motivation. You gave of yourself today. Your words spoke to me, and I thank you! The writers who belong to IWSG are an incredible bunch. The generosity amongst members is amazing. Remember that support for other writers takes many different forms. We shouldn’t underestimate the power of simple words like ‘well done’ or ‘keep writing’. It may be just what that person needs to hear at that particular moment. I feel like by sharing like this you are doing a lot. Just knowing we’re all in this means so much. Don’t knock that. Sometimes that’s the most needed thing you know? Thank you. It’s such a relief to know that others feel the same way sometimes! Just by talking about the challenge you give back. Just by talking about your own insecurities you give back. Just by telling your stories you give back so very much. I don’t think you realize how refreshing it is to find a person willing to open up, say here I am, just me. Knowing there are others, like ourselves, that is more than enough.